The Watching Dead Mid-Season Seven Premiere Party with Jessthulhu! 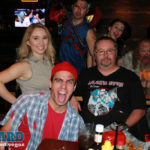 Thanks so much to everyone who came out to this past Sunday’s The Watching Dead Mid-Season Seven Premiere Viewing Party with Jessthulhu, hosted by the cast of Evil Dead the Musical in Las Vegas at Shakespeare’s Grille & Pub in Henderson. Everyone enjoyed the premiere of the best zombie show on cable, the raffles during the commercial breaks, the awesome zombie caricatures by Jessthulhu, and the prop replica barb-wire bats from Superheroes For Sale. We even had a few folks show up in costume just for the fun of it. We’d also like to thank Jessthulhu for providing those zombie caricatures, Superheroes For Sale for those bats and last, but not least, thank you to the cast and crew of Evil Dead the Musical for emceeing the party for us and ensuring that everyone had a great time. We hope you all enjoy the photos below. Feel free to download and/or share them. Congrats to all of the raffle winners from The Watching Dead Mid-Season Seven Premiere Party. Be sure to visit our blog to stay up-to-date on what’s happening next from your pals at Fat Beard!